Chris Packham, Michaela Strachan and Martin Hughes-Games are live in the countryside, updating on some of the characters that we last saw at the end of Springwatch. Autumnwatch returns to its year-round home in the heart of the Cotswolds, the National Trust's Sherborne Park Estate, to catch up with some of the animals that we met back in spring and meet a new cast of characters that are moving in for the season. Chris Packham, Michaela Strachan and Martin Hughes-Games look back at the barn owl and kestrel families we were following a few months ago, updating on what happened to the young birds over the summer, and follow the action on the live cameras, bringing everything from badgers to mice, trout to bats. Martin continues our investigations into the wider estate, getting right into the Sherborne brook to get a fish-eye view of the habitat and Michaela reports on a colony of bee-eaters that nested in Nottinghamshire over the summer. Gillian Burke is in Bournemouth on the south coast, staking out a very special garden and getting to know its foxy inhabitants and setting them an intelligence test to see just how crafty a fox really is. 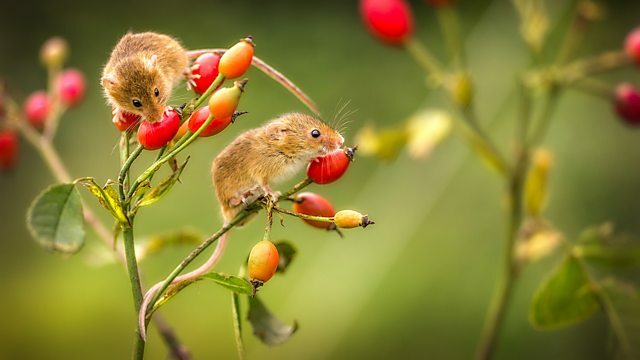 There are pieces on the cutest mammal out there, the harvest mouse, a filmmaker who has spent three years catching the comings and goings in one incredible garden, and a new citizen science project, 'seabird watch', in which the Autumnwatch viewers will attempt to do years of scientific work in just one week. Get the latest wildlife programming news and discover shows with BBC’s email newsletter.